In light of California's recent drought-induced water restrictions (cutting excessive water use on golf courses, school campuses, traffic medians, and other urban landscaping), the Los Angeles Times has put together a list of foods that use up the most water to produce. "Basically, one almond requires a gallon of water to produce," LA Times' George Skelton pointed out last week, in an article wondering why farmers "get a pass" on excessive water use. 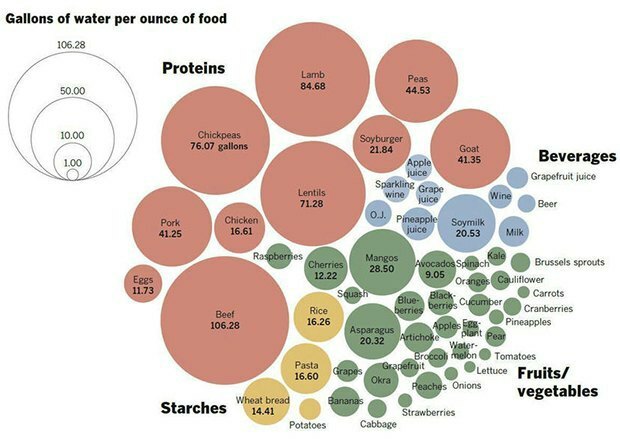 Here they some of those excessively water-consuming foods, measured in gallons of water per ounce, in the Los Angeles Times' graphic. The numbers are staggering; beef, for example, uses 106.28 gallons/oz, to 20.32 gallons for asparagus. This bodes poorly for hummus and goat-cheese covered soy burgers.